More than 200 people in 14 states have either died or shown symptoms in an outbreak of rare fungal meningitis linked to contaminated pain injections, federal health officials said Sunday. Fifteen people have died. The Centers for Disease Control and Prevention said 203 people had meningitis, while two had infections in their joints. The CDC has also published its first case report of the outbreak, which began when a Tennessee doctor diagnosed a patient with fungal meningitis on Sept. 18, nearly six weeks after getting a steroid injection for back pain. The CDC says 26 of the patients have a confirmed fungal infection, and all but one are infected with a type of black mold called Exserohilum. It’s never been known to cause meningitis before, although it’s common in the environment and can cause sinus and eye infections. One patient has Aspergillus, another fungus that occasionally can cause meningitis if injected into the spine, as well as other infections. Both grow slowly and don’t cause the classic symptoms of meningitis. “Early in this outbreak, many patients with meningitis had only a few mild symptoms,” the CDC and state health offficials say in their report. Worse, treatment can last months and requires infusions of two strong antifungal drugs, the CDC says. Right now, no one knows how long patients will have to be treated, and the drugs themselves can cause severe side effects such as kidney damage. As many as 14,000 patients may have been given the tainted steroids. 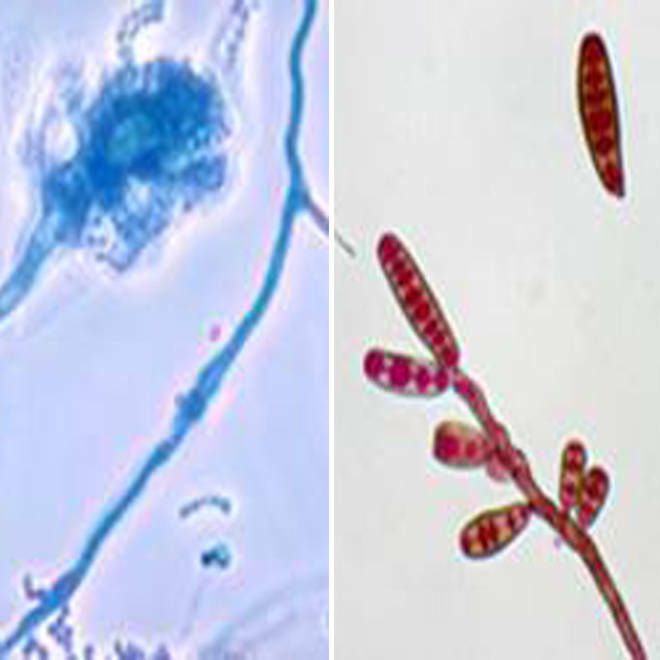 “Early identification and treatment of patients with fungal infections might reduce the risk for serious complications, such as stroke or death,” CDC says. Meningitis is an inflammation of the spinal cord or the membrane surrounding the brain. It's extremely serious when caused by bacteria; viruses can also cause meningitis. Fungi and parasites cause it more rarely. Most of the patients in this outbreak have complained of headaches. "FDA urges patients who believe they received an injection or other product compounded by NECC to remain vigilant for the signs and symptoms of infection, including meningitis. The signs and symptoms of meningitis include fever, headache, stiff neck, nausea and vomiting, photophobia (sensitivity to light) and altered mental status," the Food and Drug Administration said in a statement. State and federal health officials are trying to find out how and why a Massachusetts pharmacy, the New England Compounding Center, managed to distribute so many vials of the steroid, called methylprednisolone. It can be injected into the spine or joints such as the knee or ankle to treat pain. Massachusetts state health authorities say it appears NECC broke regulations in distributing the high volume of drugs. All of the cases so far have been linked to three affected batches of the steroid, although all of NECC’s products have been recalled. A sister company, Ameridose, is also being investigated. "Based on the business relationship between NECC and Ameridose, FDA and the Massachusetts Board of Pharmacy launched a joint inspection at the Ameridose facility in Westborough, Massachusetts on October 10, 2012," the FDA said in a statement. "As part of our efforts to protect the public health, FDA is investigating whether certain aspects of compounding practices and facility conditions observed at NECC may be present at the Ameridose facility. FDA will review whether Ameridose has procedures and facilities necessary to safely produce and provide sterile drug products. At this time, there is no known contamination of products produced by Ameridose." Compounding pharmacies - heroes or outlaws?